Seattle City Councilmember Kshama Sawant and Mayor Ed Murray have traded remarks after Sawant called on Murray to use police to block federal immigration raids. 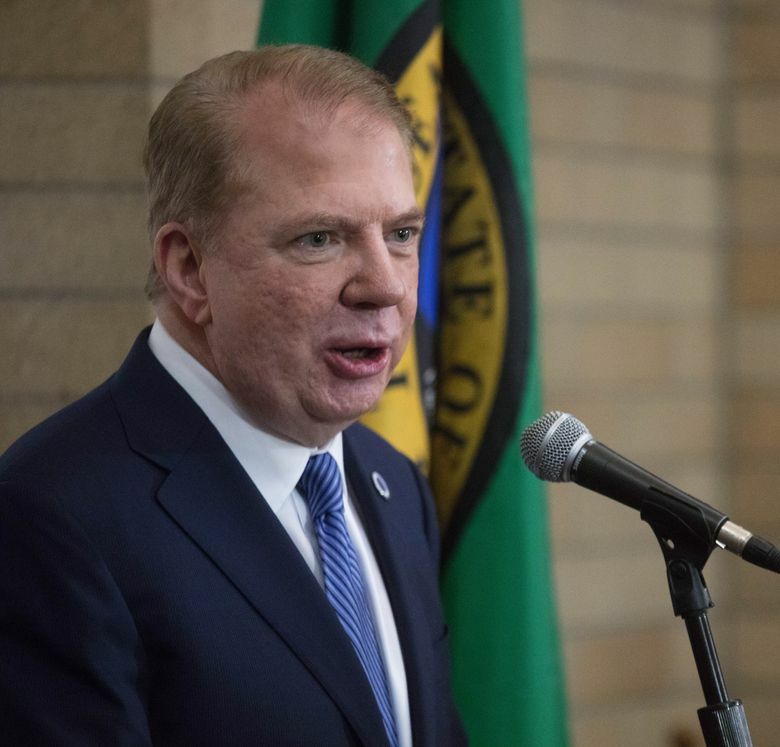 A call by City Councilmember Kshama Sawant for Seattle police officers to block President Trump’s immigration-enforcement agents from detaining immigrants here has touched off a war of words between her and Mayor Ed Murray. In an interview with KING-TV last Friday, as she helped lead a demonstration on the steps of Seattle’s federal courthouse demanding the release of “Dreamer” Daniel Ramirez Medina, Sawant challenged the mayor to take the extraordinary action. “I’m urging Mayor Murray — if this is a sanctuary city — do not use Seattle police against peaceful protesters. Furthermore, deploy Seattle police to block ICE from seizing immigrants,” she said, referring to U.S. Immigration and Customs Enforcement. Murray bridled at the proposition, issuing a statement hours after Sawant’s remarks. The mayor has touted Seattle as a sanctuary city because it limits its involvement in immigration enforcement. But he said obstructing ICE agents would be going too far. “We will continue to stand up for our values, have faith that the judiciary will defend the rights of all who live here and take legal action where necessary,” Murray said. But the city and its Police Department “cannot stop Immigration and Customs Enforcement or other federal authorities from conducting raids,” the mayor said. Suggestions such as Sawant’s could lead to “violent scenarios” that would “undermine the commitment to peaceful protest called for by so many,” he added. Murray warned against leading undocumented immigrants to believe that they might be protected by police from ICE agents. “Being dishonest with the communities in our city targeted by the Trump administration is irresponsible and dangerous,” he said. The mayor didn’t name Sawant in his initial statement, but he addressed her more directly in an interview this week. He said ordering police to halt ICE agents would mean breaking his oath of office, in which he swore to uphold the U.S. Constitution and city laws. “I would need to resign, and I would think (Sawant) would need to do the same,” he said. In an interview this week, Sawant sought to clarify her position. She seemed to draw back somewhat from her call for police to block ICE. 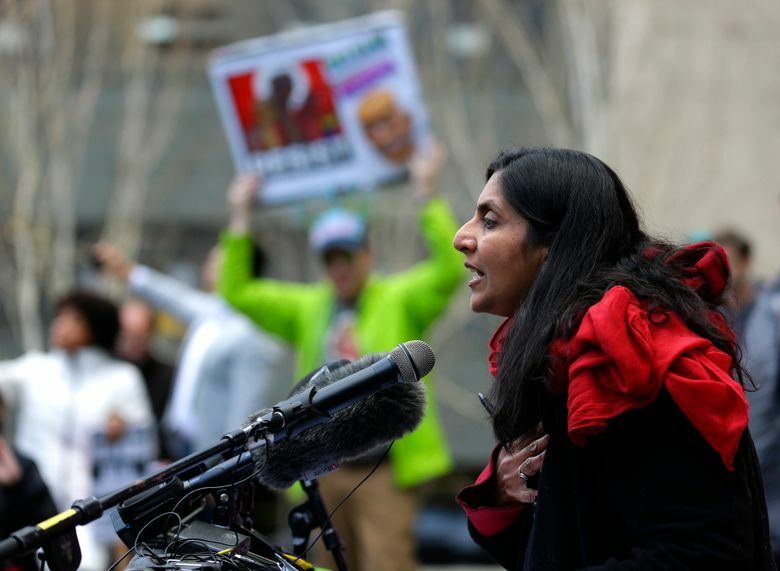 “I just said one sentence at the protest and had a very specific understanding of what I meant by that — obviously not any kind of violent confrontation,” Sawant said. But the council member again challenged Murray to do more to stop the Trump administration from detaining and deporting people. The mayor should declare that Seattle police won’t arrest peaceful protesters engaging in civil disobedience, Sawant said, slamming the mayor for sending officers to a demonstration at Seattle-Tacoma International Airport last month. If demonstrators were to use a sit-in to attempt to prevent ICE from detaining someone, “What will the mayor direct the Police Department to do?” she said. The council member asked Murray about calling Seattle a sanctuary city. “A lot of people have asked me, ‘If Seattle is a sanctuary city, how is it ICE can come and take my family members away?’ That’s a very good question,” she said. The term sanctuary city has no legal definition. Murray considers Seattle a sanctuary city because it forbids its employees from inquiring into a person’s immigration status unless otherwise required by law or court order. Police officers are exempted from that policy when they have reasonable suspicion to believe that a person has been previously deported and has committed a felony. Murray said the policy doesn’t protect people who commit crimes from being arrested and prosecuted. The idea is to make immigrants who haven’t done anything wrong feel safe interacting with the police.